September is National Honey Month, so I’m on the lookout for unusual honey recipes. Dukkha (duqqa) is an Egyptian condiment of toasted nuts, spices, and herbs. This homemade version combines brilliantly with honey to make a unusual topping for fish that’s crunchy, sweet, spicy, and hearty. You can adjust the spices to your liking; in particular you could double the amount of red or black pepper if you’re going for a hot and sweet taste. The natural oils in hazelnuts, almonds, and sesame seeds benefit both heart and skin health. Plus, they make the topping exotically delicious. It’s important to use a thin fish, such as snapper, rockfish or black cod (sablefish). The trick to this recipe is that the honey in the topping will burn if broiled too much. A thinner fish cooks faster, which is desirable. Note that the serving size is small, only about 3 oz. of fish per serving. The nuts, seeds, and honey make the thick topping extremely rich, adding considerable heft to the dish in terms of both protein and oils. Be sure that the fish is fresh, so it is firm enough to hold up to the pressing on of the topping. I hope that you enjoy this National Honey Month with some appropriately sweet cookery! 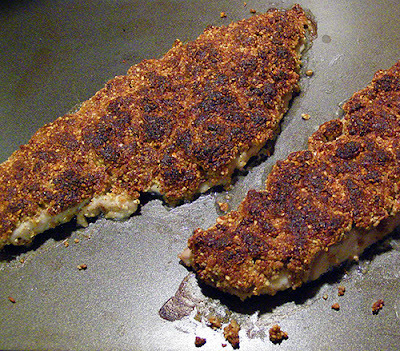 2 rockfish or black cod fillets ~13 oz. total wt. Remove any bones from fish fillets with tweezers and re-refrigerate. 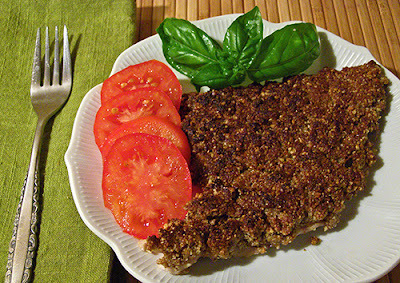 Heat hazelnuts and almonds in a small skillet over medium heat till lightly toasted and fragrant, about 5 – 7 minutes. Roll and rub hazelnuts in towel immediately to remove most of the husks. It’s okay if some husks remain. Set nuts aside. Lightly toast sesame seeds and cumin seeds in small skillet over medium-low to medium heat, until seeds are fragrant and sesame seeds are golden, about 5 minutes. Remove from heat and set aside. 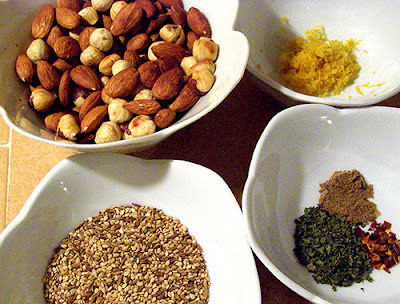 Combine toasted nuts, toasted seeds, and red pepper flakes in food processor. Process until mixture becomes fine crumbs. 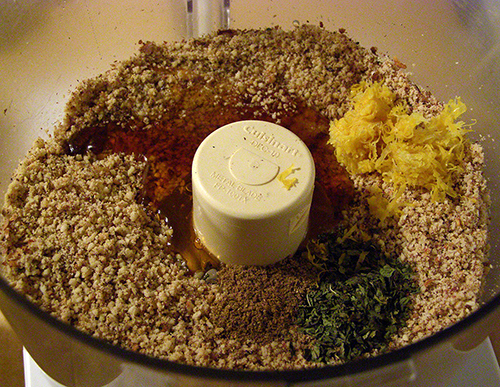 Add honey, oil, lemon zest, dried mint, and ground coriander to food processor. Process until mixture is well-blended and sticks together, scraping down sides of processor as needed. Remove mixture to bowl and blend in salt and pepper to taste, starting with ¼ tsp. of each. Preheat broiler. 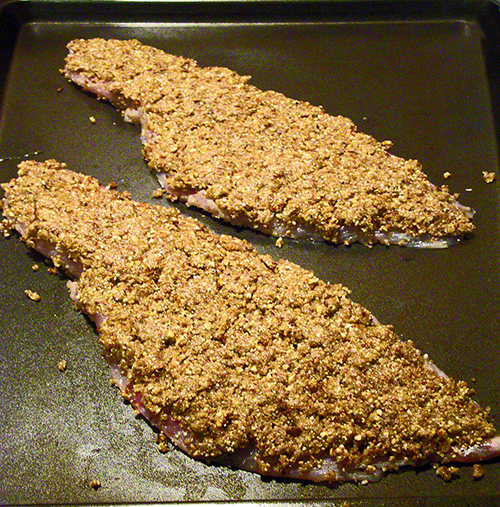 Arrange fish fillets on rimmed baking sheet. Press topping onto fish, using small handfuls to create a thick and even layer over each fillet. Broil about 5 – 6 inches away from heat source. WATCH FISH CAREFULLY as the honey will have a tendency to burn if heated too fast. Broil about 5 – 7 minutes, adjusting distance from heat source if needed, until fish is cooked through. Remove from oven and serve immediately. Sliced raw tomatoes and steamed green beans are easy and complimentary accompaniments.